The Ensuring Access — Encouraging Support Project aimed to promote the payment of child support by offering noncustodial parents in Harris County a variety of services to resolve their access and visitation problems. It was conducted by the Attorney General of Texas (OAG) in collaboration with the Harris County Domestic Relations Office (DRO) to assist parents with child support cases to enforce their visitation orders by providing free services including attorney consultations, parent conferences and legal enforcement actions. 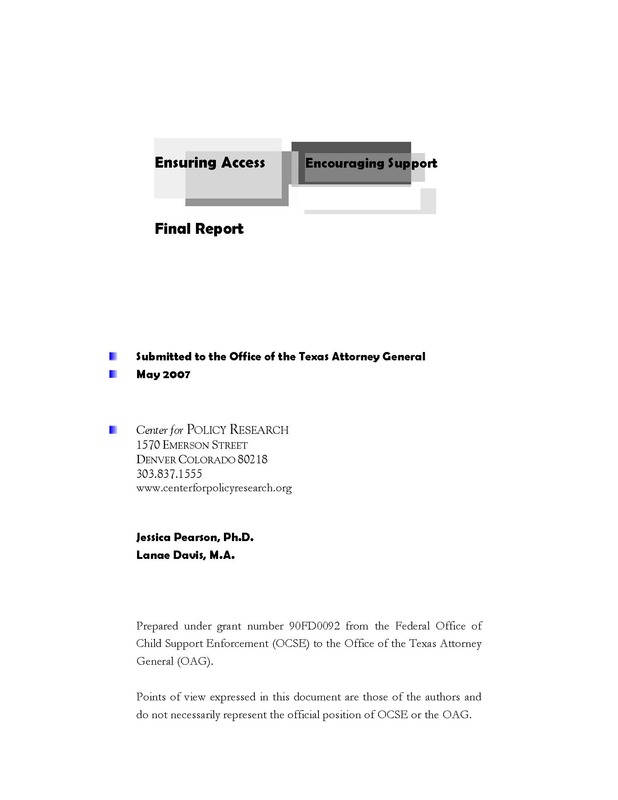 During February 2005 to December 2006, 875 noncustodial parents with cases in local child support offices in Region 6 who disclosed that they had visitation problems were identified and randomly assigned to receive services by DRO staff (high-level treatment) or printed information on visitation (low-level treatment). The evaluation involved collecting information from multiple sources on noncustodial parents in both groups including telephone interviews six moths following project enrollment and a review of automated child support records.